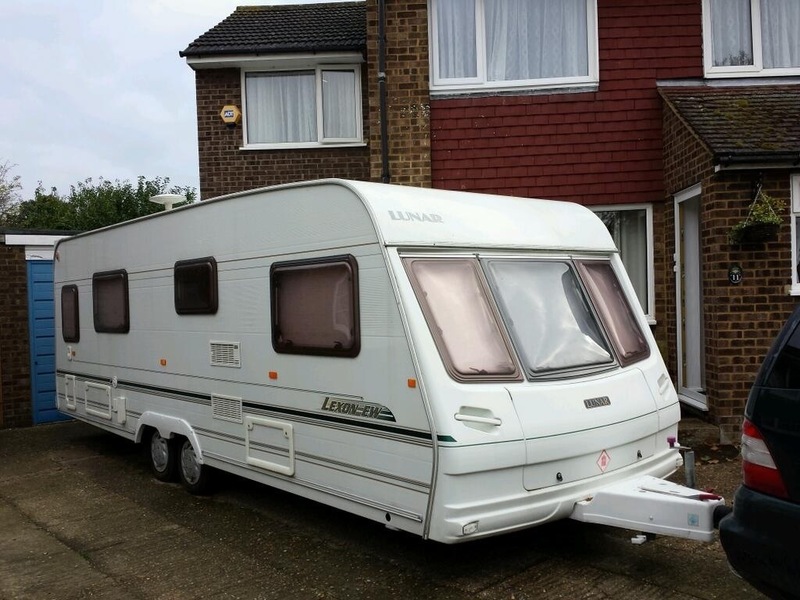 The caravan which we are currently living full-time in is the lovely Lunar Lexon EW (2002). It met all of the criteria of having a full width bathroom, fixed bed, large kitchen area and plenty of seating! As it is so heavy, I can’t tow it on my license (yet!). Despite it’s size though, it is easy to maneuver around a site! Have a look at some of the other posts in the blog to see it in more detail. Currently, we have only holidayed in a caravan. Namely a Rapido Exportmatic (circa late 1970’s / early 1980’s). This is towed by a Kia Sportage (2005). The Sportage is the XS model, so benefits from climate control, (heated) leather upholstery and a self-installed reversing camera – which is fantastic for hitching up! It has a MAM (Maximum Authorised Mass) of 2210kg, a towing limit of 1600kg and a MIRO (Mass in Running Order) of 1687kg. In order to be within the recommended safety guidelines (recommended, not legal) the caravan fully laden (MTLPM – Maximum Technically Permitted Laden Mass) must be below 85% of the MIRO – in this case 1433.95kg. The towing limit sounds perfect… if you have passed your test before 1997. Post 1997 licenses (such as ours) are restricted on what they are allowed to tow. A trailer up to 750kg is fine, even for cars which weigh up to 3500kg (note that it is the MAM, rather than the actual weight – I believe it is because it is easier to police, rather weighbridging everyone) – this makes a total weight of 4250kg. However – you can tow something heavier than 750kg, providing the total weight of the train (vehicle + trailer) doesn’t weight more than 3500kg – obviously it needs to be doable by the vehicle. This does mean that I could tow some caravans with the Sportage weighing up to 1290kg, but not with a heavier vehicle, which is a strange situation indeed. The car and caravan are pictured below. If you haven’t heard of the Rapido Exportmatic, then I recommend looking into it. It has a MTPLM of 740kg, so can be towed by many cars, and on any current driving license. There were three models of the Rapido, with the Export being the largest. It is a 6 berth, although not as roomy as more modern 6 berths. It is comfortable with just the two of us, as we only use it for holidaying. From the colder nights we have spent in it, it would appear very poorly insulated! It isn’t too bad with an electric heater in however, luckily for us, most sites have a flat rate for electricity! It was great with my previous car (old style Rav4), as the towing limit was only 750kg. With storage space at a premium currently, the folding design is great, as we can store it in our garage. It also means that when unfolded, it has an unusual square shape, rather than the more traditional rectangular caravan. The Sportage tows the Rapido like it is not even there, if not for the bright blue cover reflected in the rear view mirror, then you wouldn’t be able to tell at all. Once set up on site, the awning slides into the four separate awning rails (folding sections, so no continuous run). 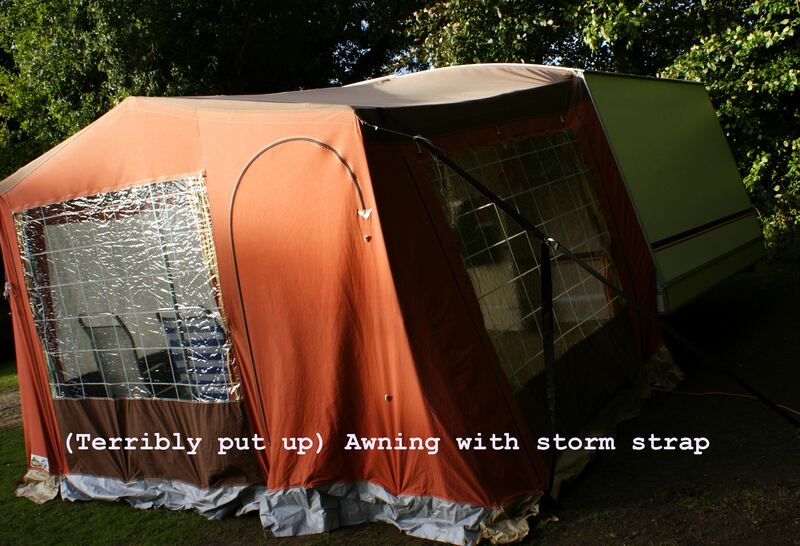 Despite being as old as the caravan, once secured with a storm strap, it is sturdy and waterproof and more than doubles the space available to you. Unfortunately, due to the age of the Rapido, spares are almost non-existent. The shelves are placed in the caravan for maximum head trauma – with the brackets taking most of the brunt, the 30 year old aluminium simply shears apart. 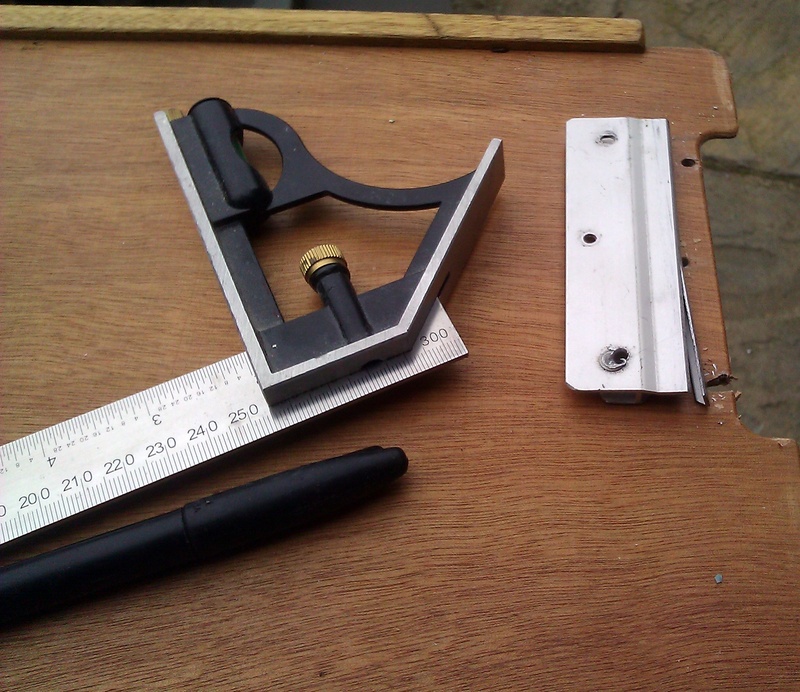 Luckily, a DIY shop sold a piece of angle aluminum which was the perfect size. A few holes and pop rivets, and it was as good as new! Whilst the Rapido has served us well, it is not livable long term. It has no heating, no hot water, no toilet or shower. These are some of the comforts of a home which we are not willing to give up to save up for a deposit, so a more modern caravan it is. We will miss the Rapido Exportmatic – it was our first step in the caravanning world, no longer will we have groups of people watching us assemble and disassemble the caravan – but in doing so, we will be able to make the leap from renting to home ownership.